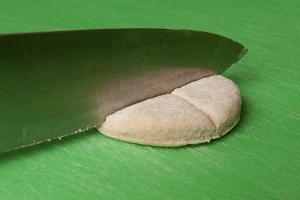 Cut tortillas into 1 ½ inch squares. 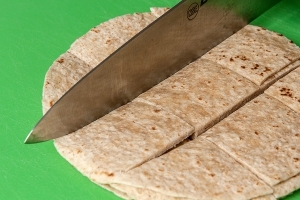 Helpful hint: To make 1 ½ inch squares, cut tortillas 3 times across in each direction. Melt margarine in a pot. Whisk in flour until well blended and smooth, about 1 ½ minutes. Combine milk, water, chicken base, salt, and pepper. Add gradually to flour and margarine mixture. Stir gently to combine. Bring to a rolling boil. Drop in tortillas into sauce in small batches. Cook over medium heat until tortillas are tender, approximately 10 minutes. Stir gently to prevent tortillas from sticking. 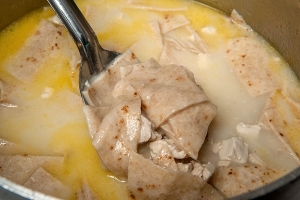 Add thawed chicken to hot mixture and heat thoroughly. 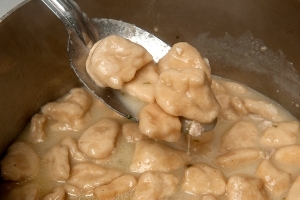 Portion with 6 ounce ladle (¾ cup) per serving. Each portion provides 2 oz. eq. meat/meat alternate and 1 oz. eq. of enriched grain. Whole grain biscuits may be used instead of tortillas. For 100 servings, use 100 1 oz. eq. biscuits. Cut it into quarters for 4 pieces of dumpling from each biscuit. If biscuits are used, the nutrient analysis will need to be re-calculated. May sprinkle parsley once the dish has been placed into serving pans to increase eye appeal. Yield: 50 servings is about 3 1/8 gallons. Cutting tortillas three times across in each direction. Stirring tortillas in the broth. 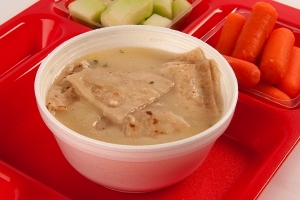 1 serving of Chicken and Dumplings (with tortillas). Alternate directions: cutting biscuits it into quarters. 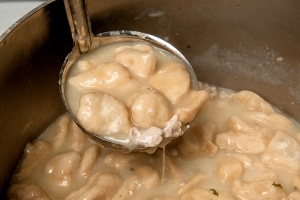 Alternate directions: 1 serving of Chicken and Dumplings (with biscuits).